You don’t care. It’s gone too far. You must continue, and to hell with the consequences. For a few seconds you wonder even if it’s really such a big deal after all. Everyone has their stuff to work through right? But then it’s the shame. The inability to meet your own gaze in the mirror. The inability to want to. And the inability to truly ignore what you are, who you’ve become; who you feel you’re destined to be. The last few days I’ve been getting a lot of emails and messages about my upcoming workshop ‘The Fat Loss Solution‘. The workshop is about finally freeing your inner fat girl; ridding yourself of the deepset beliefs that have so long held you back and created this rollercoaster of self-sabotage and despair. A rollercoaster filled with a lot of lows and not nearly enough highs. I’ve been getting emails and messages that tell me that this workshop is very much needed. But that it’s kind of scary at the same time. Let me tell you something about binging. I think, that at least on a deeper level, you already know this. But it’s worth hearing again, it’s worth hearing over and over and over and then another time just to be sure. And you are absolutely definitely most certainly not alone in this. You know my history with food by now. If you’re new here, the capsule version is that I battled bulimia on and off for over a decade. In the off periods I binge ate. I did this while working as a perky personal trainer, helping others transform their lives. I was in shape, successful, admired. I was falling apart, and I didn’t know if I’d ever escape. Sometimes I didn’t want to escape. That’s my story, but here’s what you might not know. That woman you look up to in your workplace? The one who is so well put together, with the perfect hair, face, laugh? She goes home and she eats. She eats and eats and eats, unable to stop herself. Unable to even try. That girl at the gym? The one who wears the fabulously co-ordinated Lululemon gear, pony tail bouncing in just the right way, looking for all the world like it all just comes so naturally and as though she should grace an Oxygen cover? She’s a clean eater, most of the time. Organised. Brings her protein and greens and good fats and smart snacks along in tidy little containers each day. Shrugs off the compliments and happily shares advice. But for each day or meal she eats super clean, the urge within her is building. It’s like a tidal wave, eventually reaching a point where she simply cannot resist anymore. So she eats. Anything. Everything. And then looks in the mirror and hates herself, just a little bit. And sighs, wondering if she can ever stop the cycle. And then goes to the fridge, prepares her good food for the next day. Gets her gym gear ready. Sorts out her supplements. Promises herself that it won’t happen again. I could fill Melbourne’s Federation Square from side to side with a gathering of all the women I’ve known and know who battle to break free of the bond that food has over them. And 99% of them are successful. Put together. Superwomen. Busy Mums, career women, entrepreneurs, students, gym bunnies. Single, partnered, married, kids or no kids. They’re your colleagues. Neighbours. Friends. Maybe your mother, your daughter, your sister. You. The commonality is that they are the women who others look up to, ask for guidance, admire and say ‘I don’t know how you do it all’. Wishing they could just find what is wrong with themselves, fix the problem. Wishing they could just find that one thing, like a magic string, that they could pull on and it will all just go away. 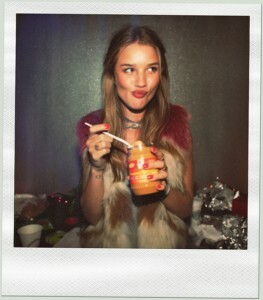 So no, your food secrets don’t make you a freak. And certainly not a rare exception. But let’s talk about fault, for just a moment. And this is what I’m talking about in ‘how NOT to get over binge eating’, this idea that it’s your fault or that you’re lazy … it’s not true. You think that you’re undisciplined, weak-willed, not as good as other people? That you’ll never get there; that you couldn’t be that girl? I want you to really hear this. Hold it within your heart, even if you can’t believe me. You’re stuck in a pattern. It’s a pattern that is incredibly tough to break through self-will or going cold turkey. The reason that you so far have always broken that ‘this was the last time’ promise to yourself is not that you have no ability to follow through but rather than you have a need which desperately requires filling. At the moment, you fill it with food. As I said, it’s a pattern. And if we’re really honest here, the food has been your friend, hasn’t it? Allowed you to escape. Been there for you whenever you need it, and when everything else feels impossible. You know that no matter how crazy things get, no matter how wrong the path of your life seems, no matter how much you lose control or never even manage to find it, that the food will be there. And the comfort. The freedom. The release. The pattern comes about for many possible reasons. Usually, a mix. Not knowing yourself. And this is the big one, often. Not knowing why it’s important to you to get that body, why it matters so much. Not knowing your purpose or your passions. Knowing only that things as they stand just aren’t enough, but you don’t know what you want instead. Enter the food. The escape. The sense of taking back control. The release. You have it within you, but it doesn’t start with self-discipline, with ‘now I won’t do this anymore‘, not even with setting yourself a motivating deadline like a photo-shoot or event. Certainly not with replacement behaviours, things that sound doable and helpful in theory but that, when the moment comes, you really don’t give a flying you-know-what about. With honouring who you truly are and who you truly long to be. Honouring your time and your worth, each day making even a one-millimetre movement to live in true self-love. Self love means being true to yourself. It means being, doing and having the things you really really want, no matter what the world around you thinks about that. It means letting go of a lot of musts, and chasing your dreams with pure abandon. It means finding your dreams, your values. Finding your joy. And then creating it, just a little bit more each day. THIS is what fills that need. And when you fill it, the need to eat will fade away. I recommend, start now with daily journalling. 15 minutes each morning, privately. Let out the crap. Purge the mind so that soon you have no need to fill and perhaps purge the belly. Lose the shame. 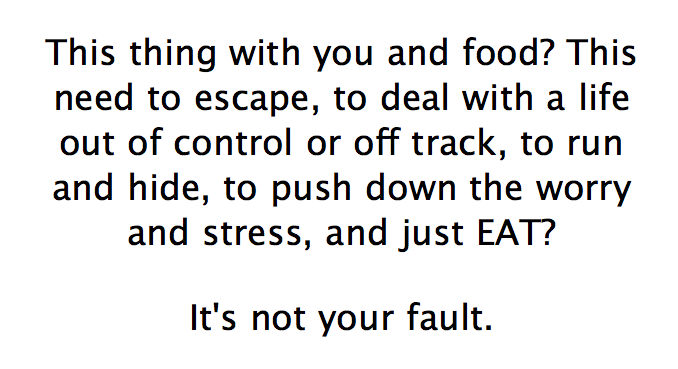 Realise that you’re not alone, that it’s not your fault. Start with this and I promise you that you are on your way. That you can do this. Get support, surround yourself with women who understand and are also going through it, and learn from someone who has been there and beaten it. The Fat Loss Solution is a one-of-its-kind workshop that I’m running in Melbourne this September 30. It’s about finally letting go of that inner fat girl, that ‘I’m not good enough’ girl. You will learn how to overcome emotional and binge eating once and for all. How to release deepset beliefs and memories. How to imprint new success-memories. How to understand yourself and how to find your why. Nutrition and supplements to deal with the physical side of emotional eating. How to overcome fears and how to successfully visualise and create your future. You can view the full details and register here. It’s a 20-spot only workshop. I may not run it again. I released it last Friday and already there are only 12 places left, with over a week left on the early-bird rate. I’d love to see you there. Love to help you, share with you, support you. Eat Carbs; Lose Fat. Really. Thank you Rhiana. I hid it for years, and then the more women I met who battled with it the more I thought I have to just start being upfront. And I’m so glad I did.